For the longest time, I wanted to grow herbs in my kitchen. I longed to have a variety of plants in my own DIY kitchen herb garden that would be ready to use whenever I needed them. I had visions of cute little planters on my counter and in my window. I tried just about everything I could think of, but the plants either got bumped and knocked over or I completely forgot to water them. For some unknown reason, I can grow just about anything outside…but inside? That is a completely different story. 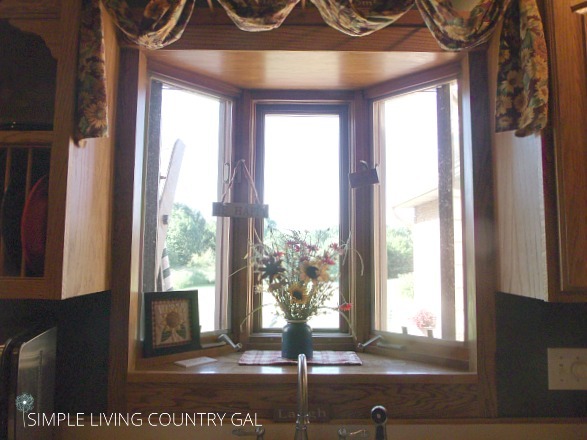 It’s so crazy, I have this lovely huge kitchen window and in it sits a vase of fake flowers. Well after several attempts and epic fails, I am uber excited to say that Hubs and I finally came up with a solution. 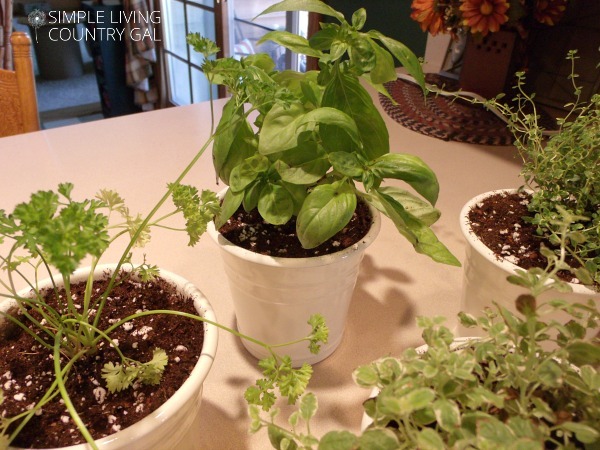 A simple yet adorable way to grow my herbs. They are able to get the sun from my kitchen window but are out of the way so they do not get tipped over. small buckets with handles or rings. Step #1 Find a nice sunny spot. You will want to make sure your plants will get enough sun that you do not have to move them. 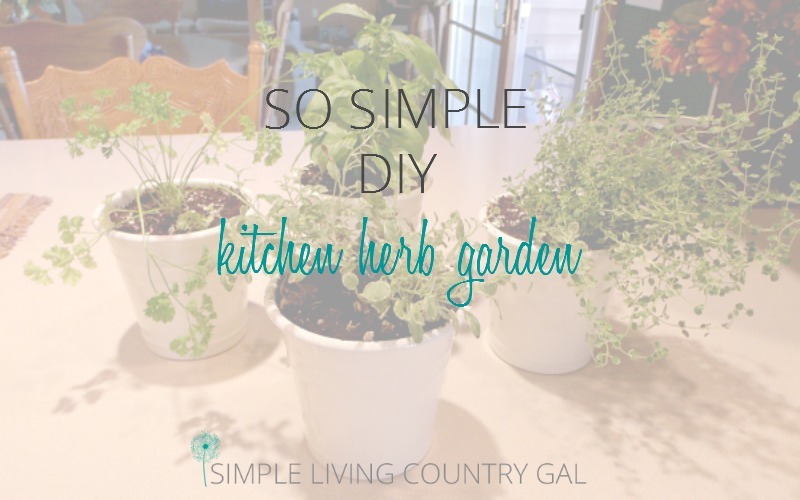 Keep your DIY kitchen herb garden in a nice warm out of the way area that gets at least a little sun every day. Step #2 Plant your herbs in your pots. I like to put a few small rocks in the bottom before planting to help give just a little drainage. It is important to make sure your pot is big enough to hold your plant. If it is not, you may want to only replant part of your herb to make sure it thrives in its new home. If you need help choosing the right pot, you can read more on that HERE. Once all your herbs are planted give them a nice water and let them sit. This will settle the soil into the pot and show you if you need to add more. Step #3 Clean the area well. I washed the side of the cabinet down with soapy water then used some rubbing alcohol to make sure there was no residue left over that would keep the adhesive from sticking. I do not want my plants to fall so I was pretty thorough in this step. 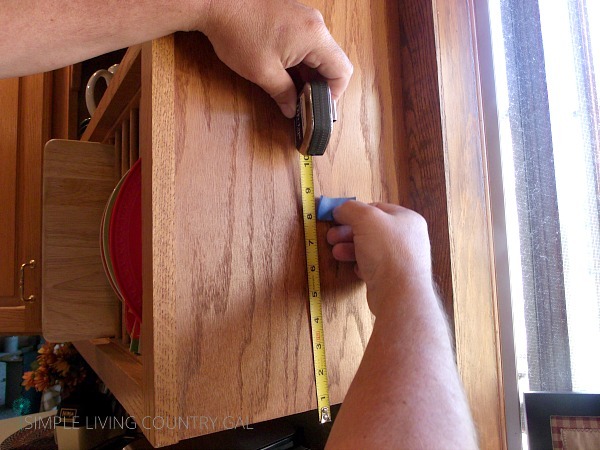 Step #4 Measure the area for your herb plants. 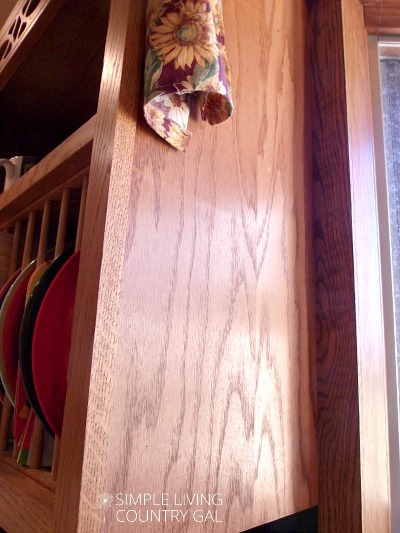 We hung our pots on the sides of our cabinets so finding the right spot was important since if it was uneven you would see it right away. We held up the lowest pot to get a good height. Hubs then marked the post with painters tape. We also needed to mark the depth so it looked even from all sides. Hubs has a thing about perfectly even and level so this part was painfully precise. Step #5 Attach the hooks. 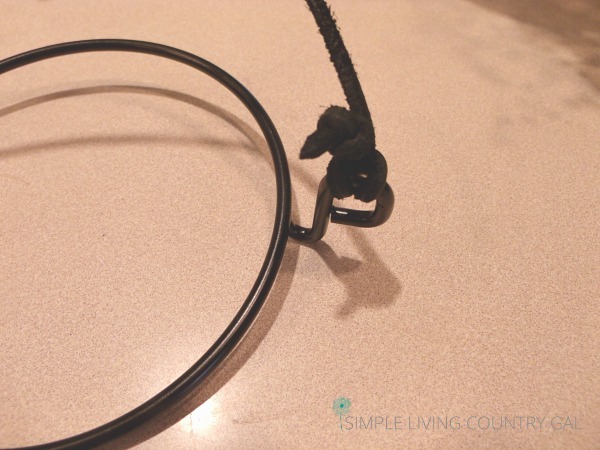 These command hooks are so great! I love the ease of use and the fact that you can remove them when you are done without damage. I used the medium size. They work perfectly holding up the herb pots that can get a bit heavy when watered. 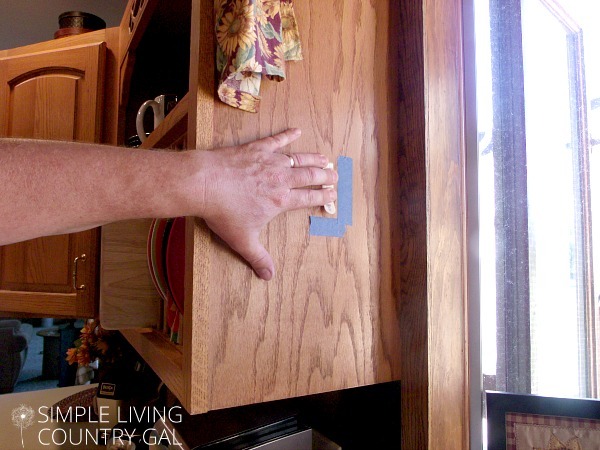 Since they are temporary and easy to remove I do not run the risk of damaging my cabinets. 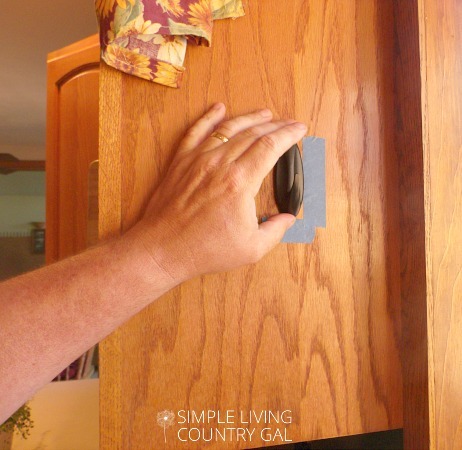 First, you add the adhesive strip to the back of the hook. Then remove the outer tape. 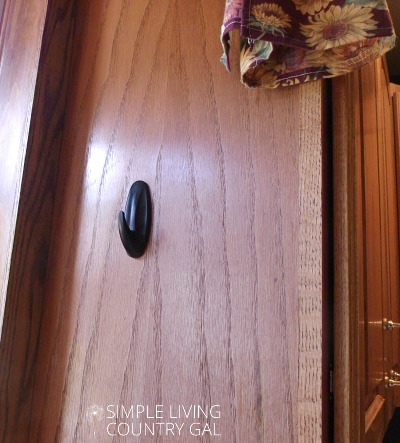 Hold it onto the cabinet for a good 10 seconds. 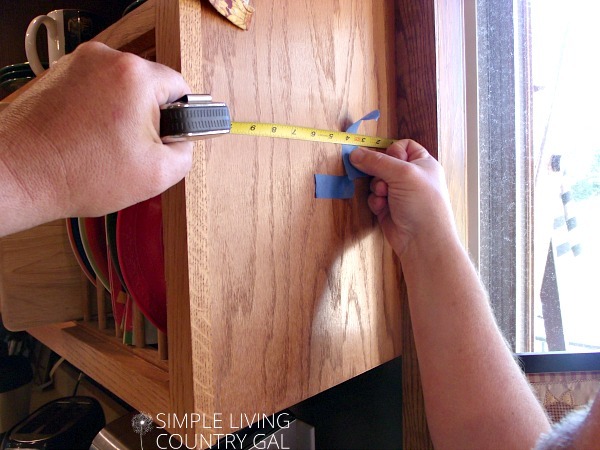 Then remove the plastic hook (by sliding it up) leaving the base still on the cabinet. Step #6 Let sit for 1 hour. This step is important so don’t skip it. 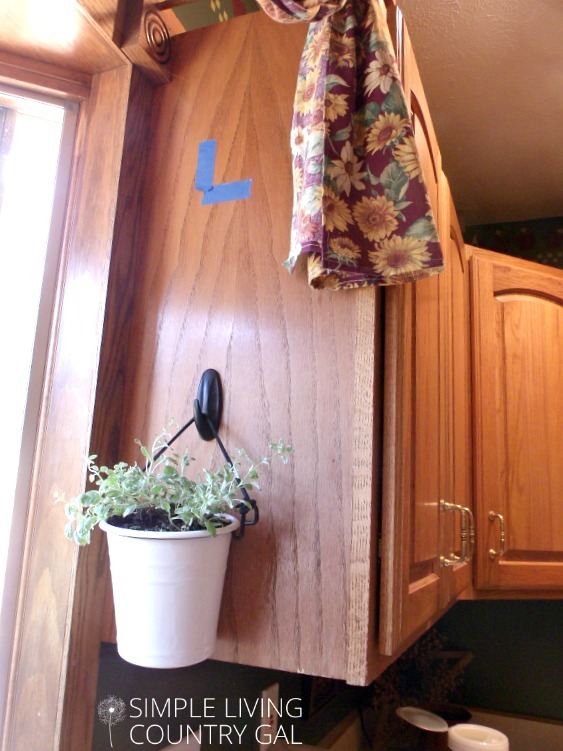 Let that adhesive from your command hook get a good cure so those hooks and plants stay in place. Step #7 Make your hangers. 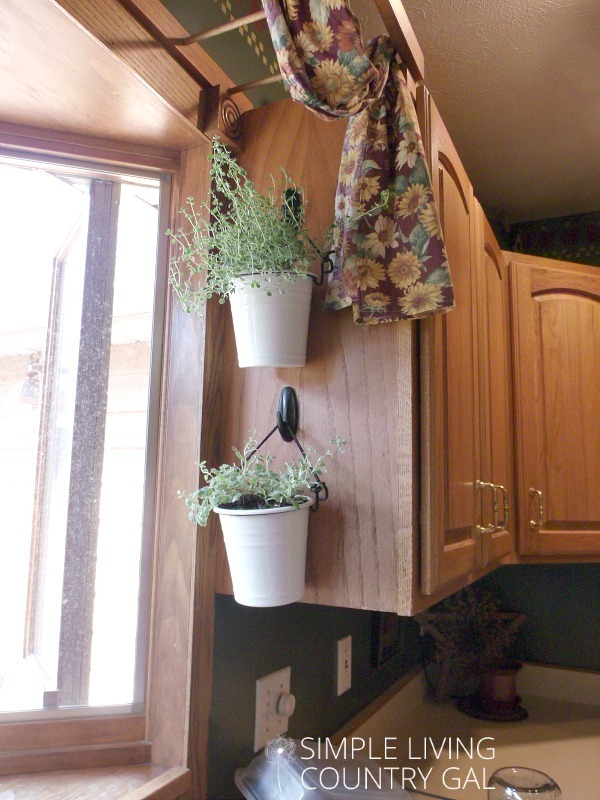 While you are waiting you can make your hangers for your pots in your DIY kitchen herb garden. 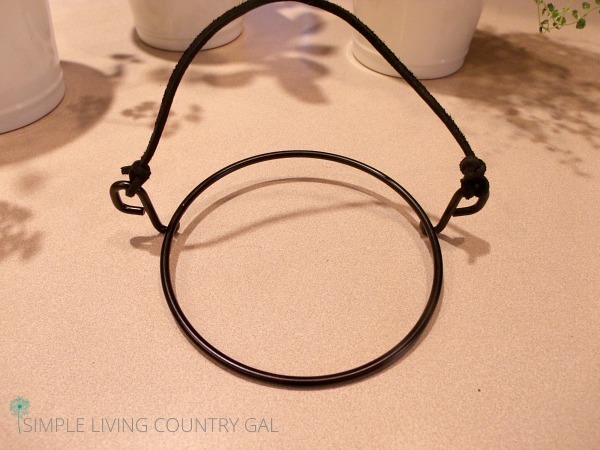 We used black leather that matched the ring handle. Hubs tried several different knots before choosing this one. It’s a slip knot on the side that is showing out and a simple double knot on the side closest to the window. Since I really liked the look of the slip knot that is what we chose to have facing out. Step #8 Once dry, reattach the command hook. After one hour you can reattach the hook to the base. At this point, it should be very sturdy. 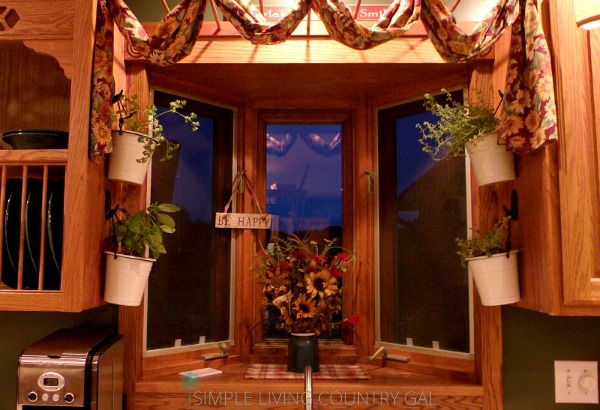 Step #9 Hang your herb pot! 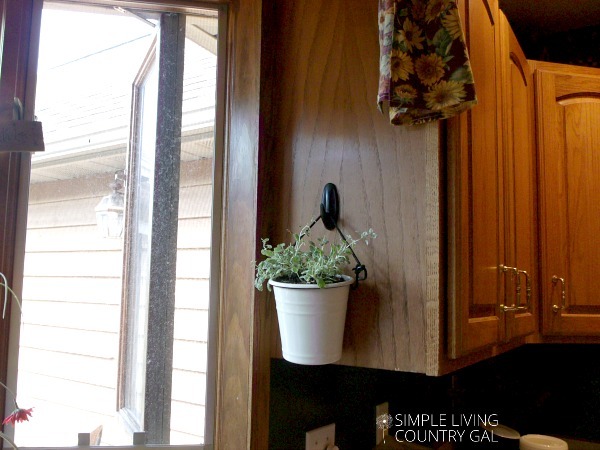 Go ahead and hang your pot in your new DIY herb garden and see how it looks. Step #10 Move on to the next herb pot and repeat. Now that you have your first pot up you can figure out the spacing for the rest. Remember to use the same amount of leather for each pot to make sure they all hang even. This was probably the most tedious part. We had to tie and re-tie a few knots to get the right length. Follow the same steps for each hook and bucket until your entire herb garden is completed. All in all this entire project cost just under $35 dollars and took a morning to complete. And yes the fake flowers are going to stay, hey….don’t judge. I can’t say enough how much I love my simple DIY kitchen herb garden. Last night for dinner I made pasta with roasted veggies and I was able to cut a few leaves of basil for my sauce. I feel like such a grown-up cook now, Giada has nothing on me! Well, except maybe she is young and simply gorgeous. Ninja Tip: Remember to USE those herbs so your plants in your DIY kitchen herb garden continue to grow well. You can read how to freeze your herbs here. Freezing keeps those fresh lovelies always ready to use and trimming will keep your plants growing strong and healthy. Win-win! Love this! I might attempt this diy myself! Great idea. Thx! Glad you liked it, it was so easy to do and cheap! I adore cheap! !